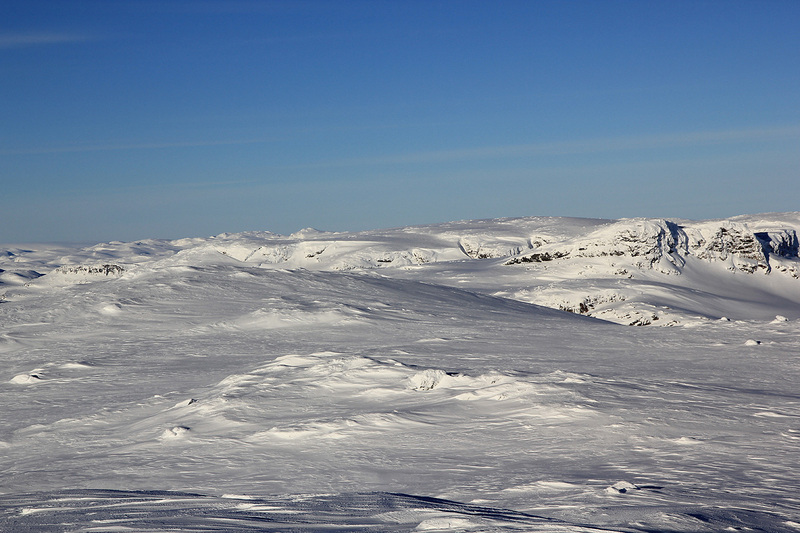 A good starting point is about 3 kilometer west of the DNT full serve hut, Haukeliseter. Haukeliseter is located along E-134, east of the long tunnel. This hut is highly recommended for an overnight stay. They have an excellent kitchen. This location can be reached by car after work on a Friday, from east as well as west. The trailhead location is near N59.84, E007.16. There should be parking on the south side of the road. Cross the road and follow the small (summer) road across the first creek. 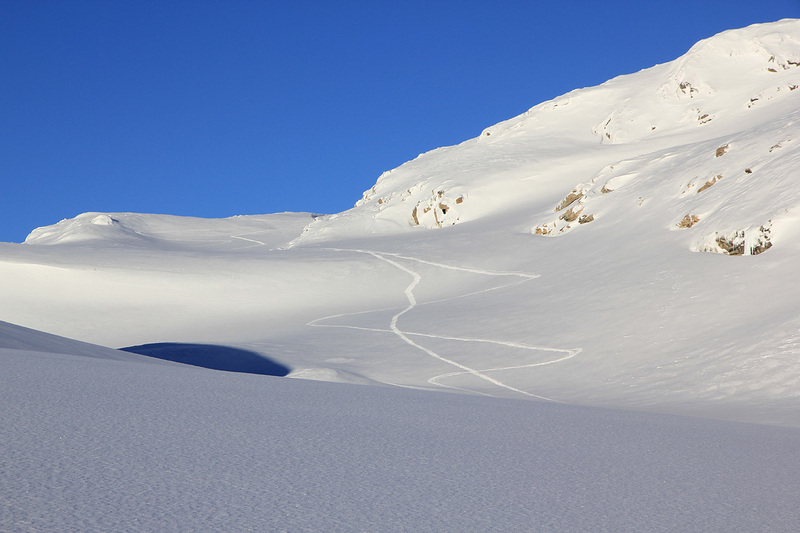 Head uphill towards point 1266, pass on its left (west) side and continue up gentle slopes east of Trollnup (1343m). Continue to the small lake 1304, then up to lake 1343 and onwards to lake 1362. Cross this lake and ski north up to lake 1443. Ski to its west end and further to the connecting area before lake 1453. Ascend north, the best route is just left of a small hill above you. 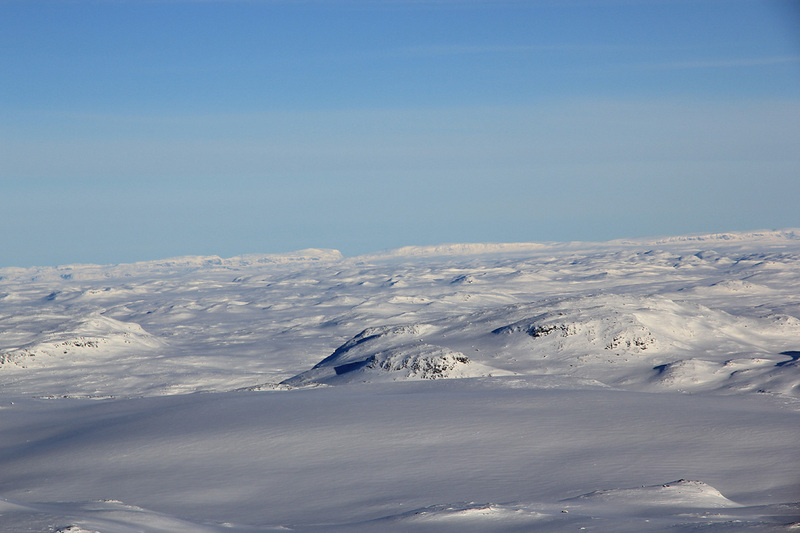 You will now reach lake 1465, cross this to its north end then continue north-west up the glacier (or remains of a glacier) staying below the Nupsegga mountain. Continue up to the 1600 level, from here obe can turn right (east) and gain the main ridge. 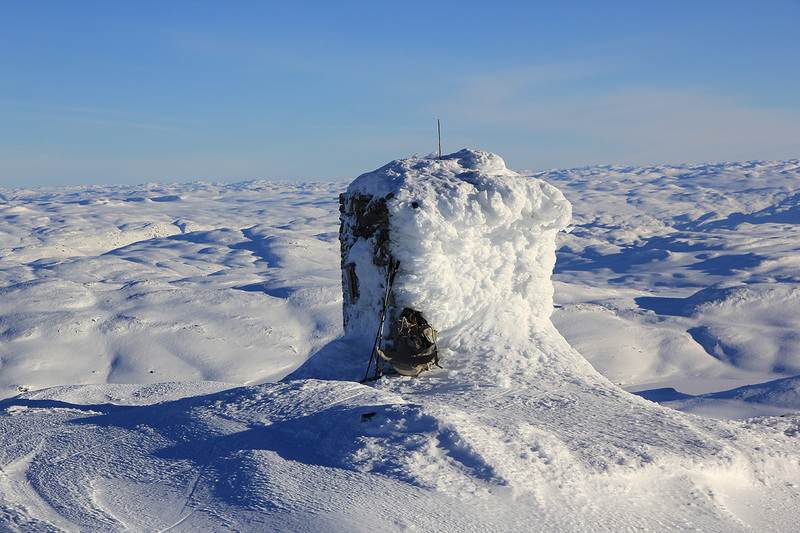 Follow this broad shoulder south to the very large cairn marking the summit. 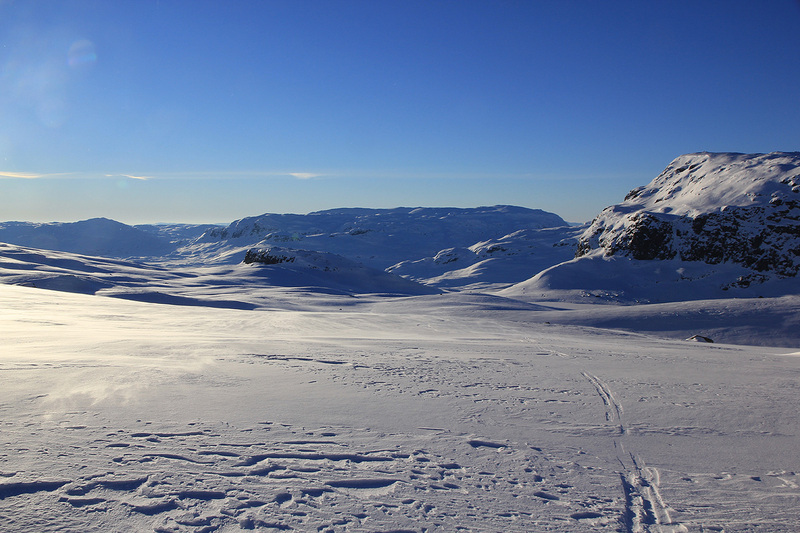 I drove from Bergen after work on Friday and arrived at Haukeliseter around 2100. Spent 2 hours in front of the fireplace with a good tasting beer. I got up at 0700, and had breakfast at 0730. The temperature showed -28 Celcius, I had noticed the day before that it was even colder near the place I intended to start. I drove back (west) about 3 kilometer and located a good parking area off the highway on its south side. Unfortunately, due to some frostbite in my fingers a few years ago, they now get cold a lot easier than in the past. So also today, cold fingers before getting the skis out of the car. I decided that today was agood day to test chemical hand warmers. I have never used this before, but carried some for possible use the last few years. They worked fine and I never had any more problems with my fingers on this trip. The original plan was to attempt Sandfloegga, however the conditions (including short daylight) ruled this out. 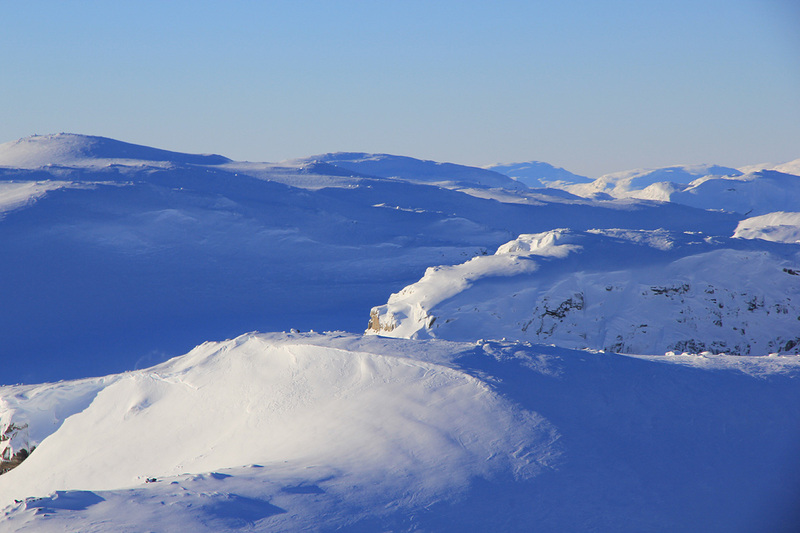 I made this decision at the north end of Trolltjønn, realizing that skiing up Trollholene would be difficult with the very hard crust that existed on part of the mountain. 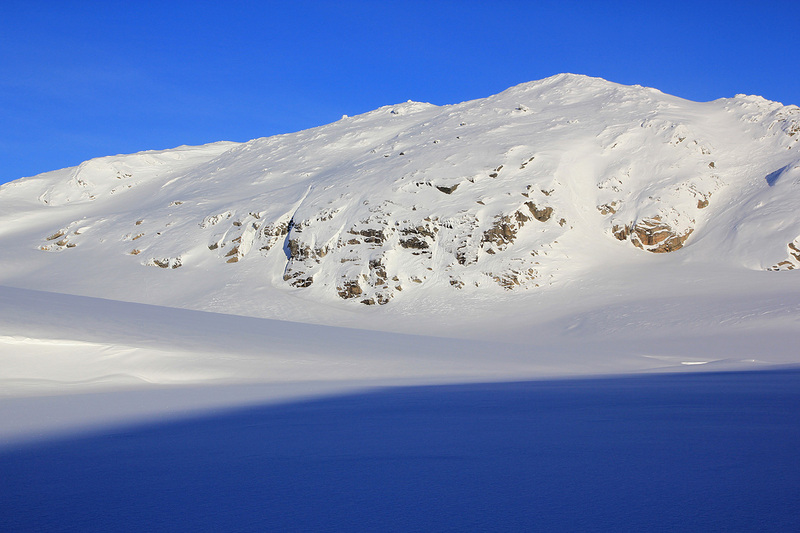 On top of this, I had actually planned to attempt a route going on the west of Store Nup, but got mixed up and skied north on the lake to the east of this peak. 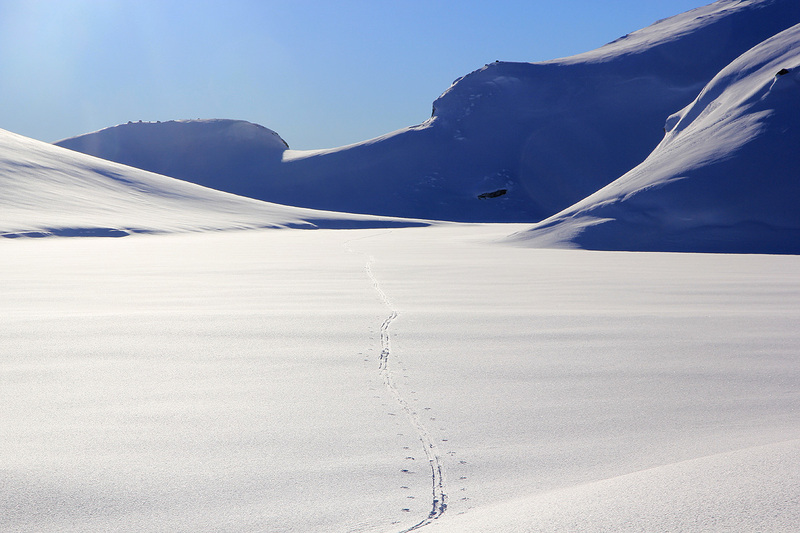 Thus, I skied pretty directly up to Lake 1453 with interesting formations on my left hand side. From here to its north end, then easily up to lake 1465. 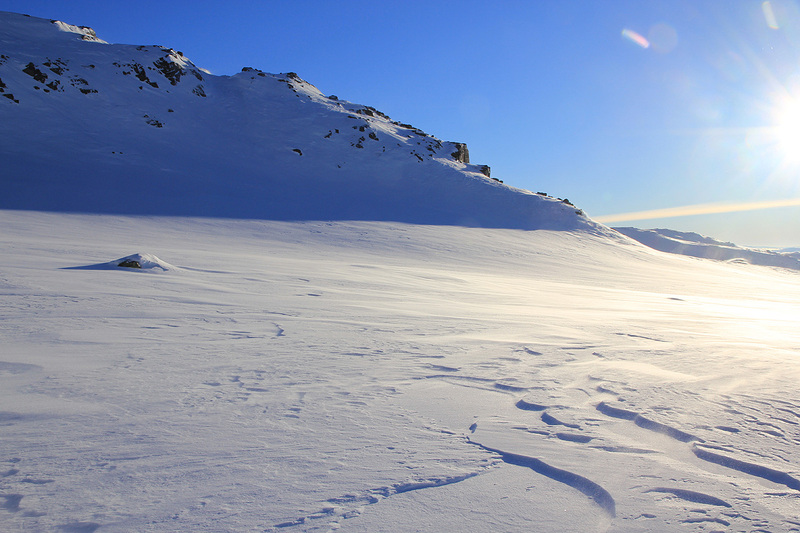 A brillant day, no tracks from other skiers, the extreme cold and the sunshine combining to make this day very special. slope was easy as I climbed slightly north-west along the base of Nupsegga. 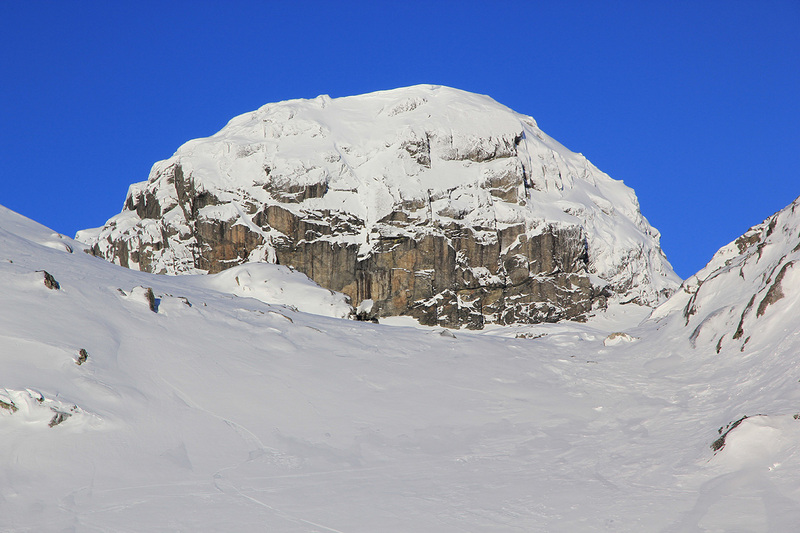 From around 1600 meter, the skiing was still easy as I turned east, then more south gaining the summit with a very lage and impressive cairn. The time was about 1205. 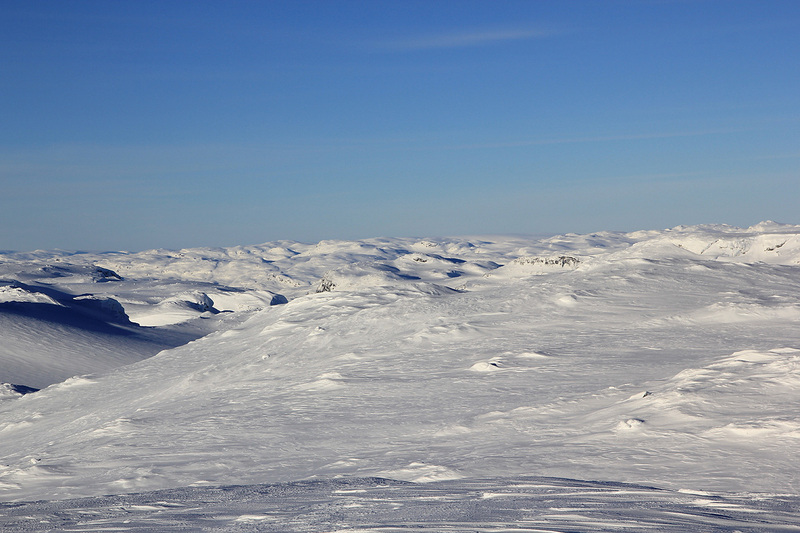 A very good viewpoint, I could see right across to Hallingskarvet on the north side of Hardangervidda. I enjoyed the great view, unfortunately, my camera did not want to take many pictures. This is not the first time, it is very possible that the camera will need replacement/repair one of these days. 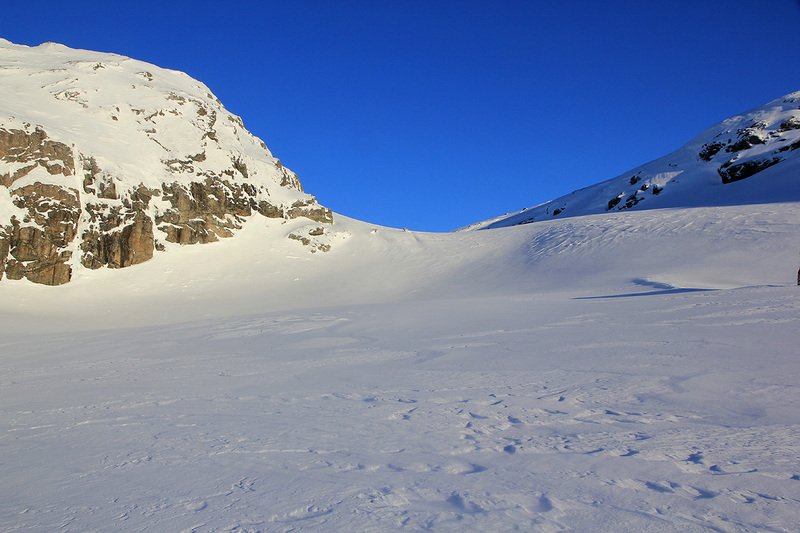 I left at 1220, skied back down the same way, but turned left and crossed Lake 1443 before skiing down to lake 1362. 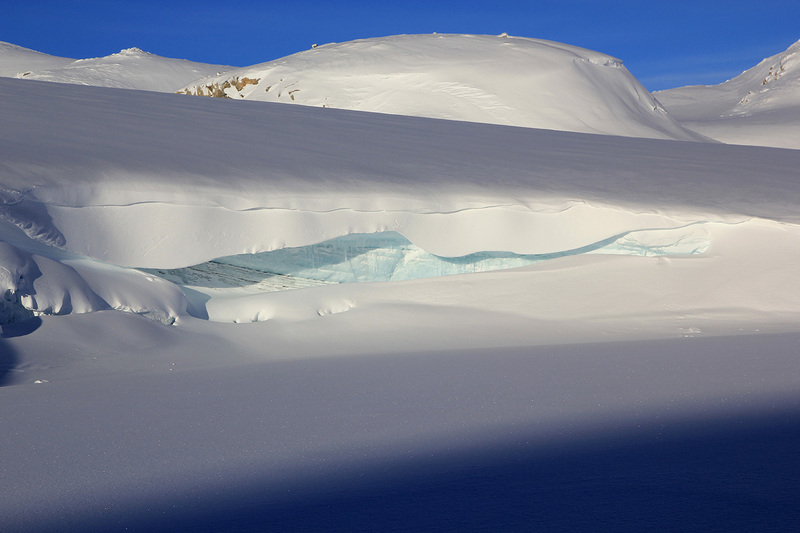 I continued across lake 1343 and 1304, skiing down east of Trollnup (1343m), before merging more or less back to my initial route of ascent. I arrived at the car at 1420, with better snow this descent can be a lot quicker. 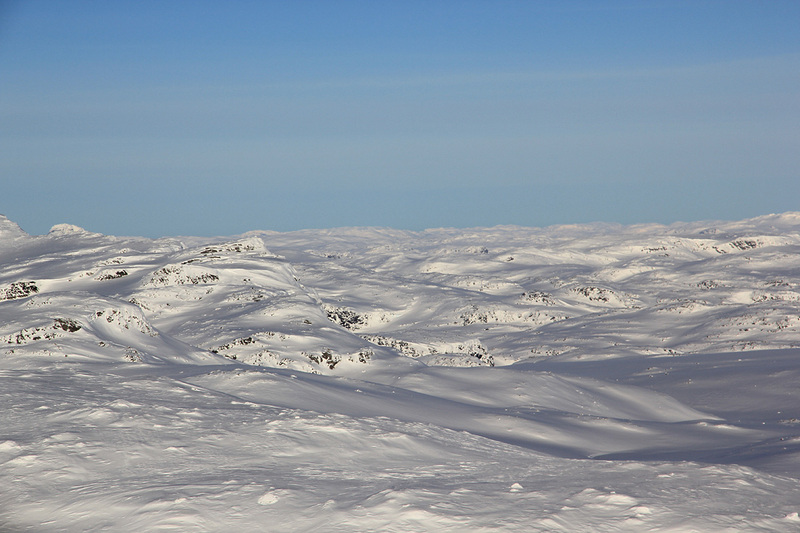 I now continued my trip to Geilo by heading across to Rauland, the Rjukan. 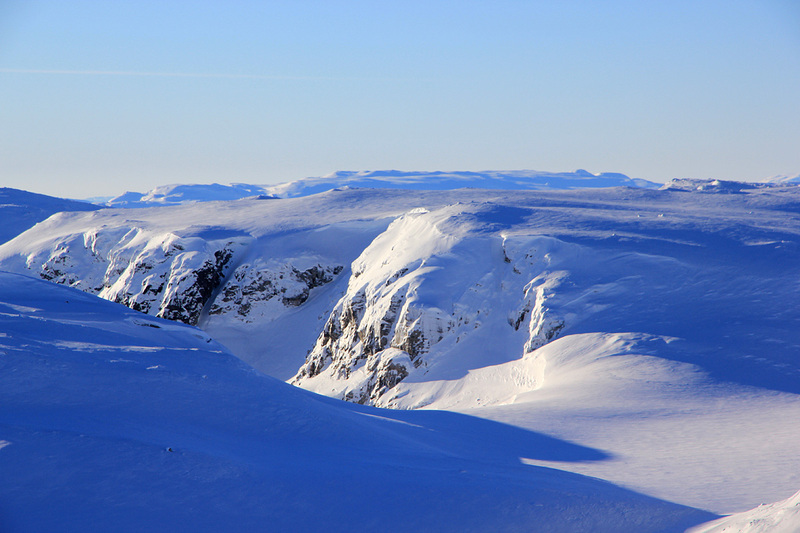 From here, one must almost drive to Kongsberg because all shorter roads are winter closed. Heading north along Hwy. 40, I decided to call it a day in Lampeland. A most unusual name for a small Norwegian community. 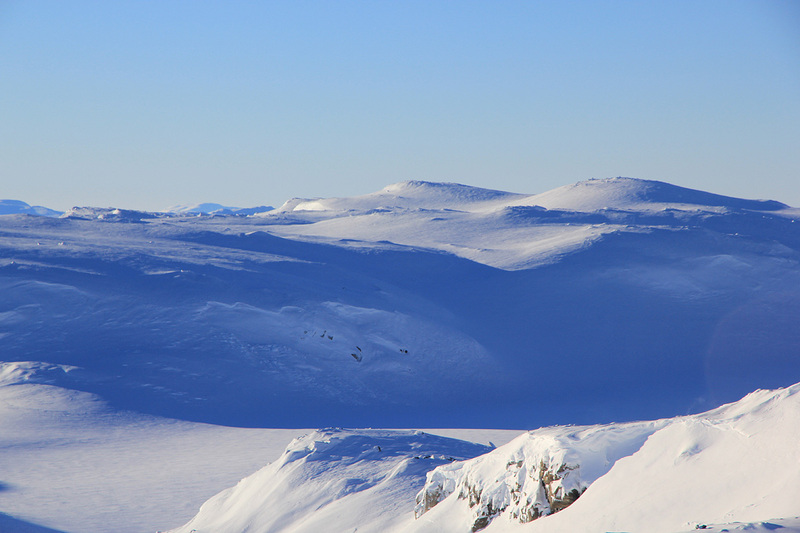 Looking back while skiing towards Nupsegga. Nice view while ascending Nupsegga.